As of right now I've settled on the front mounted trigger wheel but I can't seem to find much information on folks who have mounted the 36-1 trigger wheel from goingsuperfast.com. I picked up a pretty sweet crank sensor mount intended for this application from eBay at a fairly reasonable $100 price. 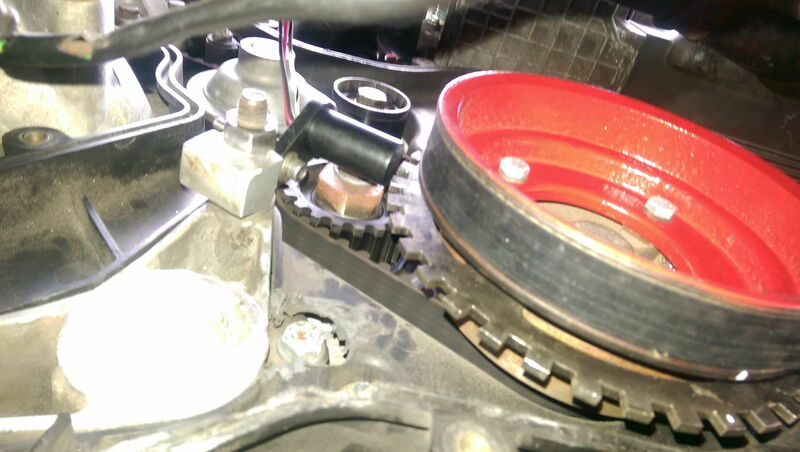 Here's the sensor mount Front mount crank sensor on eBay. Would anyone who has used the goingsuperfast 36-1 trigger wheel on their car be willing to post up some pics of the install and where you mounted the sensor? I understand on a 4 cylinder car the missing tooth will ideally be located 9 teeth before the sensor at TDC but there's no way to do it with the mount I picked up. I feel like I'm missing a critical step here but I don't have enough information to fill in the blanks. I used the goingsuperfast wheel, but my sensor location only works for a balance shaft delete engine. What if you put a longer stud in the block for the timing belt tensioner pulley, and then you could stick your crank sensor on that? Michael, I thought I remembered your solution being interesting but not repeatable for my intended use. Looks like a solid mount for sure but balance shafts are a must for me. I'll post some pics in this thread of the mount and wheel setup I've got currently. I'm just concerned I won't be able to use my setup because at best I can align the sensor to the 6th tooth from the missing tooth. No way I can get to 9. With an MS system, you should be able to set where the missing tooth is going to be. I think that would totally work if you were running balance shaft delete on an early block. Don't think it would work on a block with the late tensioner. Aaron, can MS run the standard 951 132-tooth wheel? Make sure your wiring harness plugs are in good shape, and maybe swap the sensors every 3rd timing belt change as preventative maintenace. I've read anecdotal evidence various MS boxes can play nice with the 132 wheel. For my application (S2 turbo motor) the stock flywheel would be the natural choice if the clutch could keep up. Realistically, the TTV flywheel may be the most elegant and simple solution but there's only one person who I know has ordered one and received it (URG8RB8). If I were going to add MS to an NA car, I would just spend the ~$100 on a S/S2 flywheel and call it a day. 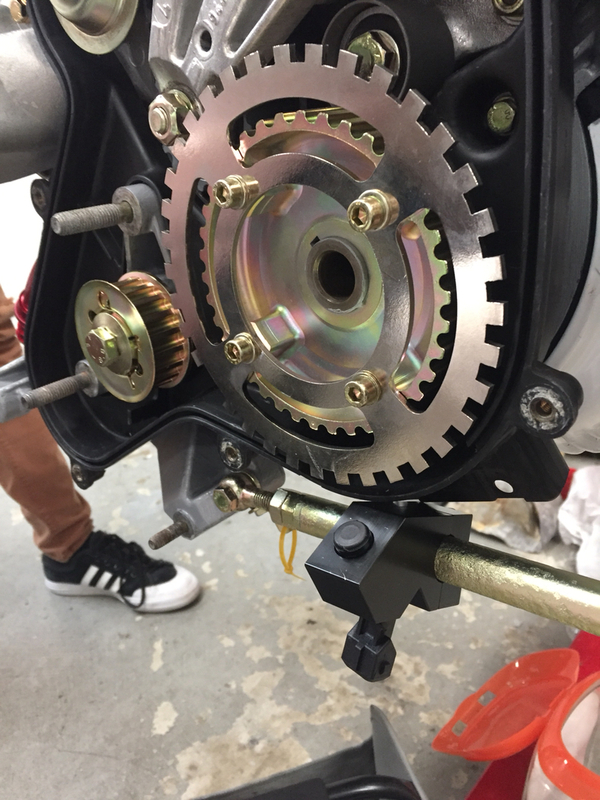 The additional power from a turbo motor makes clutch options for the smaller flywheel a bit more difficult and it's more expensive for exotic clutch parts than it is for a new flywheel. If the damned machine shops here didn't charge like they were trying to make up for six months' alimony I would probably have gotten a stock 951 flywheel notched with 60-2 teeth. I'm pretty sure AZbanks is correct and tunerstudio allows you to tell the MS which tooth has the sensor relative to the missing tooth/teeth. I haven't played with the software that much because I'm still working on the hardware. Somewhat humorously, it looks like using MS on a 951 is the most difficult application based on the availability of OEM/OEM-ish solutions. I looked at using the stock triggers but it ends up being annoying. High tooth count is questionable in a Microsquirt without using a hardware divider (132 / 3 = 44), maybe possible in a MS3X or MS3Pro because they have much more powerful hardware. Tl;dr it's possible but a PITA. I've had zero sync losses ever with a basic $40 wheel on the front and can cleanly rev to 6500 (rev limiter) all day long. Re-reading the 2nd link, it's very possible that your Microsquirt already has the uprated shunt diode and it'll be ready to go out of the box. 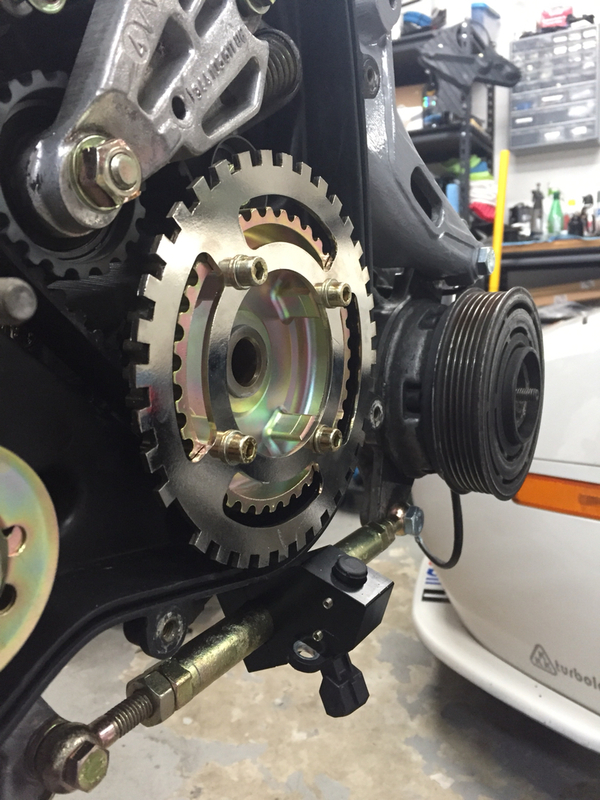 I took some pics of how my trigger wheel and crank sensor are currently set up. I know the sensor isn't correctly oriented but I'm not really chomping at the bit to start cutting my timing covers either. 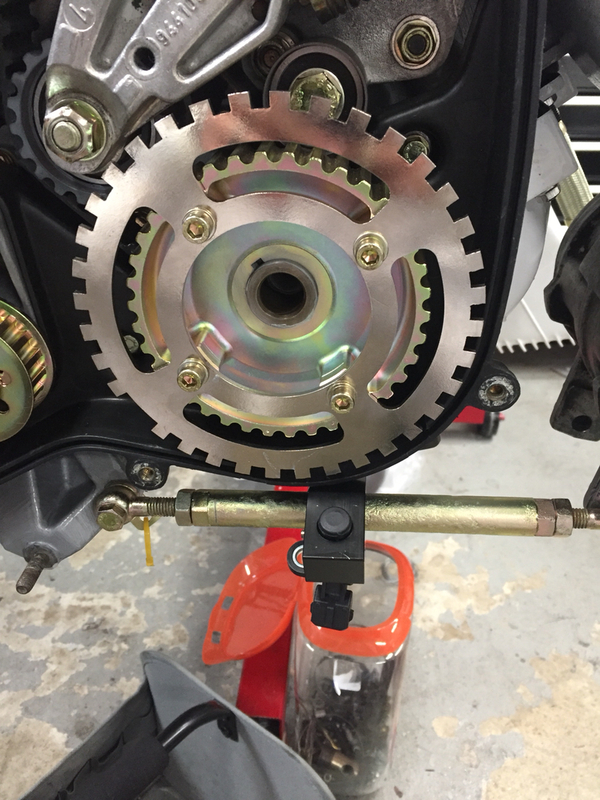 This is the $40 36-1 trigger wheel from going super fast and the $100 crank sensor mount from eBay. The crank sensor came with the mount. Not sure if the sensor will actually work with this set up but so far it appears it will. Does the sensor line up? Your ebay find is the base case for my 951. Also...that plating job is badass. I'm fairly certain the sensor will line up with tooth #5 after the missing tooth once I trim some of the plastic out of the way. The sensor mount isn't bad at all but there are literally no instructions and the seller doesn't seem to reply to questions either. The plating was done by a company in Ft. Worth. Send me a PM if you'd like the details. The tooth it aligns with isn't significant unless a) you're using an EDIS module for ignition, in which case it needs to be at a certain point or b) your missing tooth is less than, say, 15* BTDC on cyl #1 (because it won't get the "heads up" until the ignition event has likely occurred). The last point isn't even significant because you only have 35 teeth to begin with, which isn't that many to count before the next sync. Your sensor looks like a generic VR sensor and should work fine, but I'd make sure to take a trigger composite log to make sure it reads cleanly. And because there's no ground sheath (a 3rd pin, like in our OEM reference sensors) you really should consider shielding the cable against EMI, as it's near the alternator. Other solutions include using a VR sensor with that built it, or using a hall effect sensor with the same body dimensions. Thanks for the tip on the plating, I'll PM you when I have all my parts together and decide if I'm going that route. Looking at that setup, the only thing that worries me is that I have had that AC tensioner rod snap.